SurgePlus USB Swivel Charger (10 Watts, Combined) is rated 3.5 out of 5 by 21. The SurgePlus USB Swivel Charger offers a high level of protection with its 918-Joule energy rating. Oversized Metal Oxide Varistors (MOVs) absorb excess electricity for additional protection, while damage-resistant housing protects circuits from fire, impact, and rust, and prevents dents and scratches. Your devices will be safe from damage, data loss, file corruption, and system crashes that may occur due to electrical surges. The SurgePlus takes just minutes to set up and use. To get started, remove the plug cover and slide it into the bottom of the charger. Next, plug the USB swivel charger into a wall outlet. 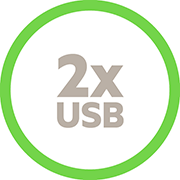 You can then use the USB cables that came with your devices to charge up to two devices at once. The SurgePlus USB Swivel Charger is covered by a Limited Lifetime Product Warranty and a $75,000 Connected Equipment Warranty. This means that Belkin will repair or replace any equipment damaged by a surge, spike, or lightning strike while properly connected to the surge protector, up to $75,000. Rated 4 out of 5 by Batman from Swivel stuck The instructions don't show that you have to press the white button to rotate the socket. You have to press hard with a knife or screw driver. It rotates fine, then. Rated 5 out of 5 by LAnnister from A must have for travelers I have been using this for a few years now while travelling. It has been very useful and can be used across the world with just the proper adapter plug. I like that the plug itself rotates which facilitates its use in hotel with weird placed electrical outlets. The only minor issue I have, is that I would like for the plug itself to be able to fold in, making packing it easier. I am not sure it is feasible with the rotating plug? Rated 1 out of 5 by xtoph from how can you call 120v only device a "travel" item? had to check three websites to confirm (here in the review comments) that this is not for use with 220-240 outlets... which makes it useless for any of the travel I do. should list this clearly in the specifications, and/or add a model for world travel. Rated 3 out of 5 by Rhino from USB Outlets I am having trouble charging my iPad Pro. I believe I need a 2+ Amp USB socket. What would you suggest? I love the rotation feature. Rated 5 out of 5 by ellen from Berkin surge protection I really like this swivel charger for charging in Canada, though reading the various reviews, I have the same problem concerning 220V. I will be travelling to Indonesia (220V) and now not sure if I will need a voltage converter or if I can just use this charger with the correct adapter for 220v. Rated 5 out of 5 by Rolandb7 from Perfect in my travels I recently bought and just wondered why I waited so long. When traveling for business it always an adventure to get enough plugs. This solved it all for me with just this one device. 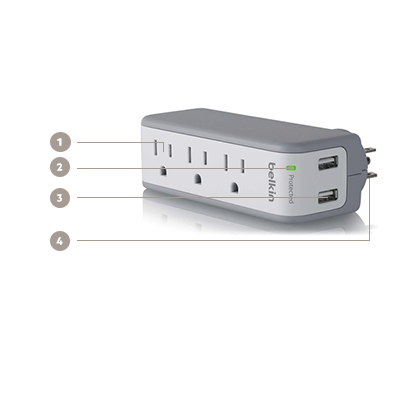 Rated 1 out of 5 by Tim B from Plug does not rotate I just got the Surge Plus. I push on the button on the back side as far down as it will go. While holding the button down, I try to rotate the plug. The plug will not move. Rated 5 out of 5 by mtnskier from Convenient and easy to use. This product is terrific. On board ship we only had one outlet to charge devices and limited space. The swivel plug was a life saver. It handled all our various device chargers. 2 improvements I would like to see are: accept dual voltage 120/240V and a 'fold in' plug. Rated 5 out of 5 by socceruci from At Home Use and 3 Months Travel in Europe I bought this for home so that I could charge all my USB devices by my night stand. Later I brought it with me on an EPIC European tour. It held up to all kinds of craziness, 220V outlets, and more. What an amazing product! The swivel plug was a really good idea that made this product super flexible for me. Thank you product engineers for making a great product. I somewhat believe other users of the product do not know what they are talking about. Rated 4 out of 5 by Sammy1 from I agree....very handy! I bought this a couple of years ago, and found it very handy to take on cruises to charge multiple devices at same time. Its compact and easy to carry. The USB ports are perfect for charging my global cell phone that requires a USB connection. The only issue I have is when staying in hotels overseas, and only 220V outlets available. I've read reviews on message boards - some that say its ok to plug into 220V, it only reduces the surge protection, and other reviews that say don't do it. I actually did plug it into a 220V outlet last year, using only an adapter for the plug, without any problems. Maybe got lucky? I am a little worried doing this, but my equipment is all rated for 220V, maybe only risking this device? Rated 2 out of 5 by Deacon from Seems like a good idea - but . . . 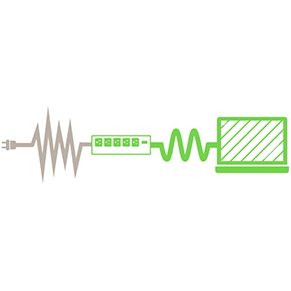 Directions do not clearly describe or show how USB ports are to be used; the "cables" (one only in package) provided are for a unknown device device. Diagram suggests the two USB outlets are different and have different purposes. Not going to chance "bricking" my mobile devices by using the USB ports.